You guys surely are aware that MDF terrain has been all the rage for the past three, four years or so. 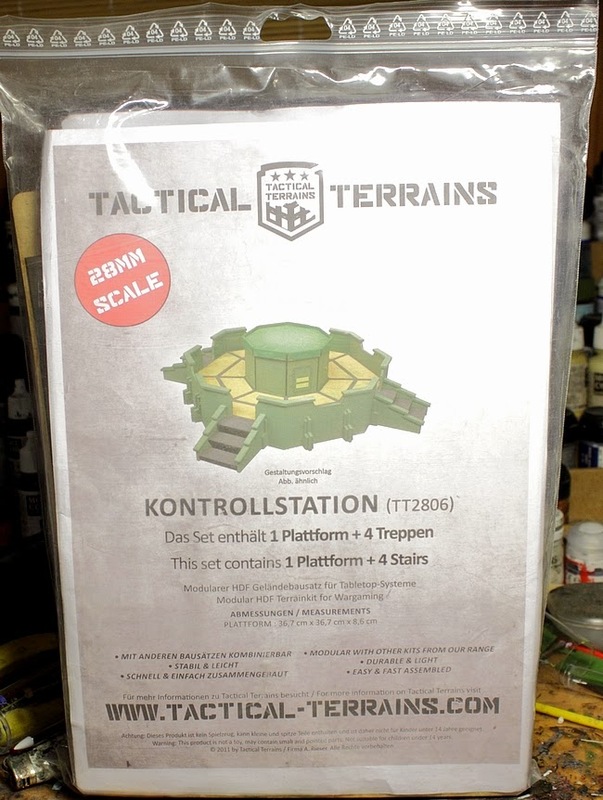 Today I'll look at the offerings of some MDF from Germany - the Control Station kit from Tactical Terrains. Tactical Terrains have been around for a while now. 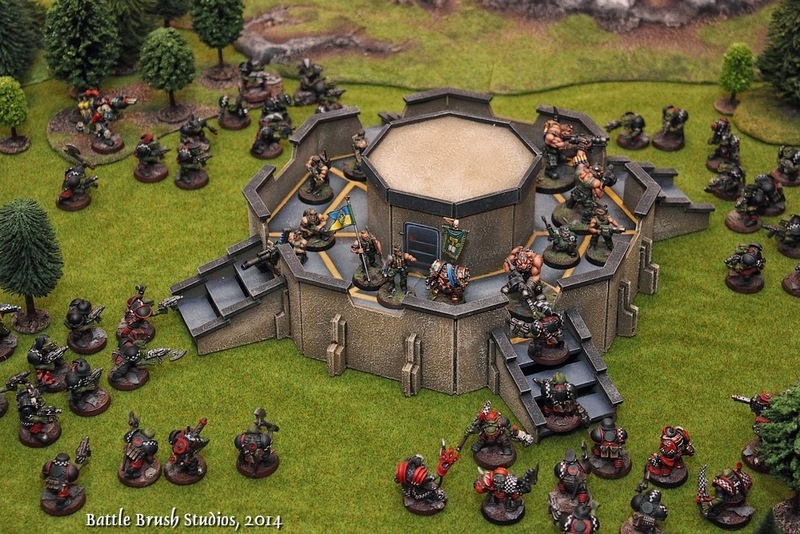 They certainly have been in the game of the whole MDF terrain craze early on. First time I came into contact with their stuff was when I got into Infinity a few years ago and played on a table with some pieces of theirs at my local gaming store. Last year I realized I simply have too little in the way of 28mm wargaming terrain so I picked up a Tactical Terrain kit that had cought my eye before - the Kontrollstation. What you get is a large plastic baggy of MDF sheets and a paper sheet with the name, picture and assembly instructions. When I was little my father used to build castles from what nowadays is called papercraft. Also, the very first model kits I built were mdf dinosaur skeletons. This kit reminded me a lot of those things. Guess it's all coming back sooner or later. You actually get several sheets. The pictures only show one of them so you get an impression. The parts are easy to push out of the sheets, no fuzzy edges or anything. Some single parts need an extra push but it's all very neat and sturdy so you can't really do much wrong. However, some work is required with pushing the little bits out of the holes into which the connectors are going. Also be prepared to clean some parts with a file because some of them are connected to the sheet like plastic bits on a sprue and you want even edges. So a little work still is required. Once that's done though you can start putting the whole thing together. The construction is quite some fun. I used regular PVA glue from the local hardware store. A few of the connectors might need some scraping to fit the holes but overall the fit of the parts is very good. During building the model you soon will realize the size of this thing. Is is rather huge. Next thing I did was giving it a black basecoat and let it lie around for almost a year. Not a necessary step per se but unfortunately this is often the case with terrain projects. 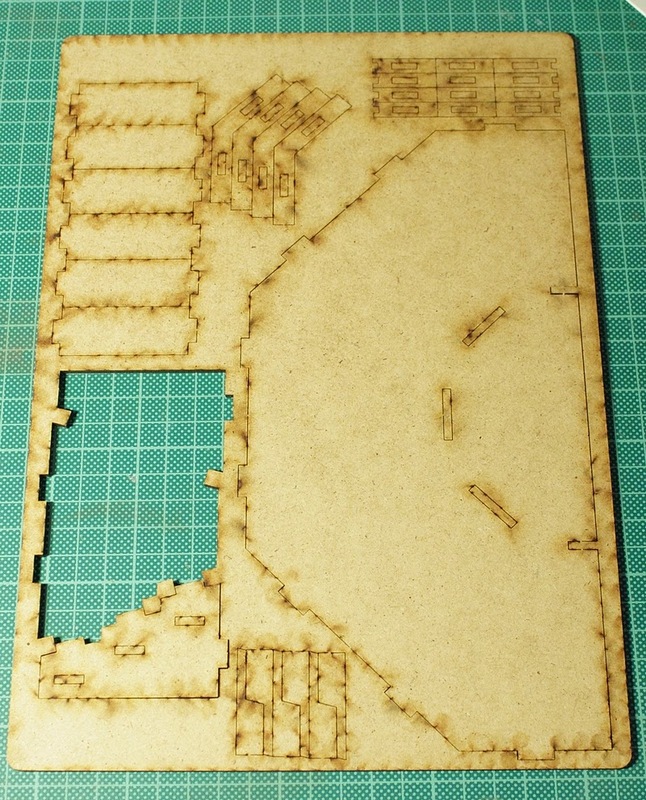 After wiping off the dust I realized that the piece just lacks the texture to make it in any way look like something of weight so I brushed on a light mix of PVA glue and different sorts of fine sand (just over the walls and roof of the central cabin, sparing the platform). Not too much, not too thick, just so it looks uneven. Would have loved to use a textured spray but I didn't have any at hand. One note on the little spaces between where walls meet: I considered filling them up with some putty but in the end decided against it. After that was dried I gave it a basecoat all around. I wanted to avoid grey just because the sand coloured looks more interesting. The platform and stairs I were painted grey. To add some more colour and to make use of the nice details lasered into the surface I painted that yellow. The top parts on the walls and the parts around the roof I painted very dark grey. Some drybrushing, painting the doors and adding some rust to them and that's that - finished. I like the way the whole piece is designed from a gameplay perspective. First, it blocks a whole lot of Line of sight, which is always a good thing. It can be accessed from all sides and the walls actually give you either full cover or, in the middle parts, are just high enough to cover a model up to the hip so they can fire from cover. So it gives a lot of cover to spice up the gaming table whilst not being one of the "inpenetrable fortress" kind of pieces of terrain which lead to all kinds of problems. The top I left removable for several reasons. First, I might add some additional innards like consoles, computers or valves. Second it's just easier to keep track of models being inside. Third, I actually might do something with the inner side of the roof so you could switch between the regular roof and maybe a small landing pad or something. So you can Get to Da Choppa! All in all, I think that this piece of terrain is really worth it. 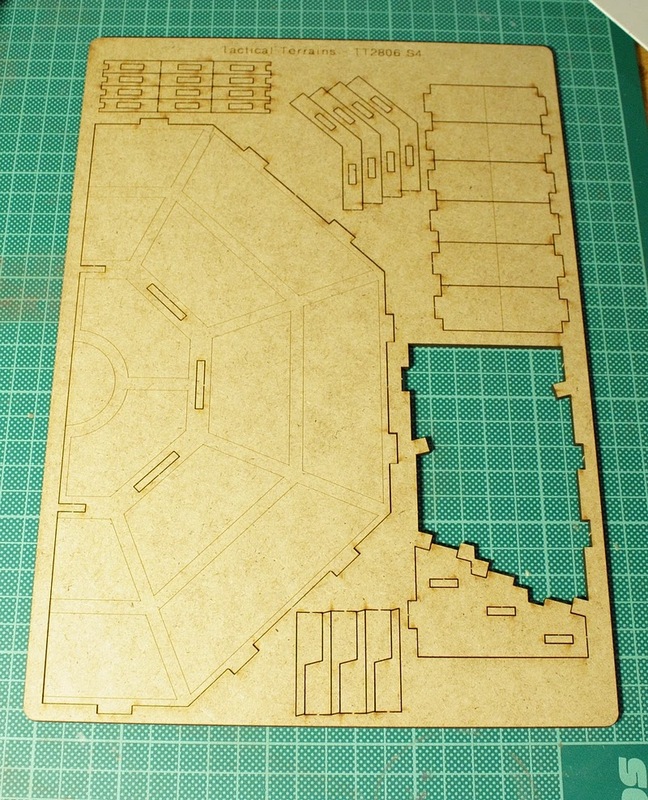 As everything MDF, it requires some work (and it's time well spent), and I did about the smallest amount of work required to make it look decent, but it's a very large piece of terrain you get out of it. It fits well for sci-fi and modern games. Measuring stairs to stairs it's 37cm in diameter, between stairs the diameter is 25cm. The walls are a bit over 6cm tall, the middle cabin is about 9cm from ground to roof. 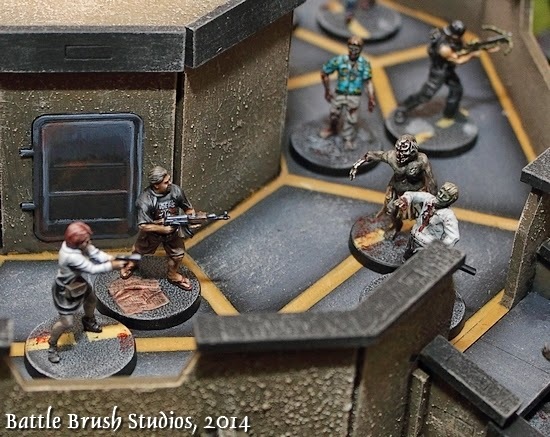 Beyond its effectiveness as a piece of terrain it makes for an excellent objective for any table. I paid € 30,00´for this kit at my local gaming store. If you order online you will pay just under € 30,00 plus shipping. At this price point this kit is well worth its money, considering the size, design and level of detail. 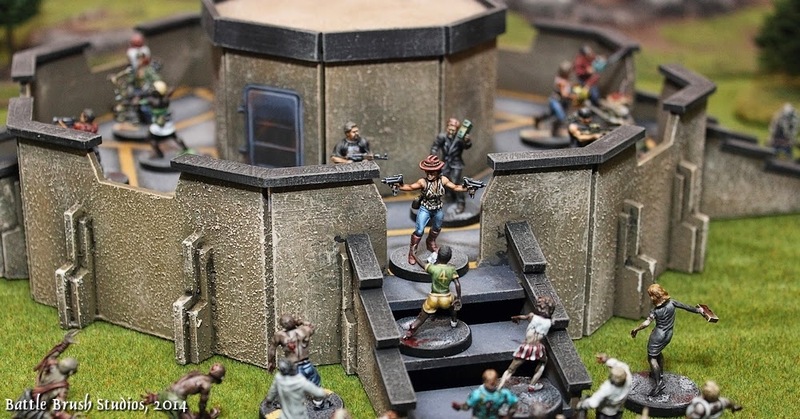 In general, Tactical Terrains' products range from "simple and affordable" (with very handy ruins starting at €10,00 each or a wall set of 1,20m length for under € 20,00) to more complex and detailled things like a house kit which is really tempting to me or warehouses. The latter cost between €30,00 and a bit over €40,00. I hope that you enjoyed the review. If you have any comments, questions or of course commission requests feel free to contact me via the comments section below, Facebook or e-mail.